Russian physician and educator; born at Dubno 1828; died at Kiev Aug. 9, 1896; educated at the local district school, at the classical gymnasium of Jitomir (graduated with gold medal in 1848), and at the medico-chirurgical academy of St. Petersburg (graduated in 1856). He was attached to the army, at that time in the field, being one of three Jews then appointed military surgeons. After the Crimean war he was appointed junior attending physician at the military hospital of Lutsk, and was assigned to duty at Kiev hospital in 1860. From 1869 to 1876 he undertook a number of commissions of a scientific nature for the government. During his studies abroad Kulisher worked in the laboratories of the most prominent French and German investigators, devoting himself mainly to the study of hygiene and military sanitation. He was also a contributor to a number of scientific works and editor of translations of classical works on medicine. Kulisher has done much toward improving the education of the Russian Jews. About the middle of the nineteenth century he came forward as the champion of systematic education for the Jewish masses, thereby making many enemies among his Orthodox coreligionists. 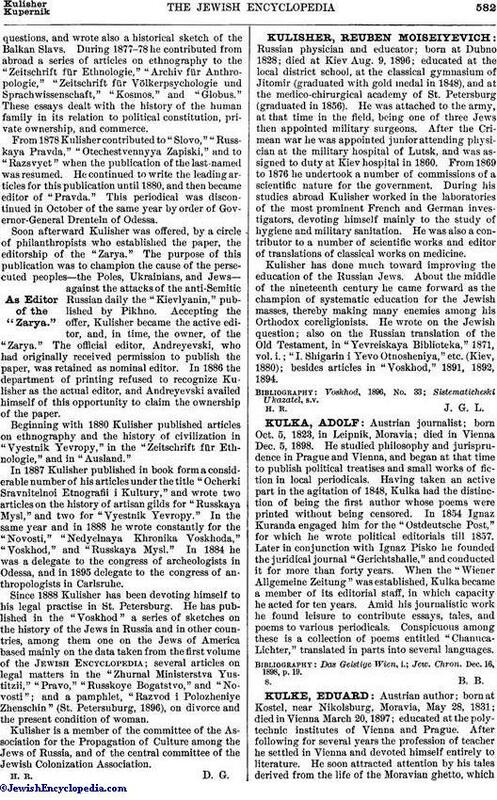 He wrote on the Jewish question; also on the Russian translation of the Old Testament, in "Yevreiskaya Biblioteka," 1871, vol. i.; "I. Shigarin i Yevo Otnosheniya," etc. (Kiev, 1880); besides articles in "Voskhod," 1891, 1892, 1894.